So I realised that as I had started to receive Christmas cards, that I needed to get my act together and finish the Christmas cards I have been making. 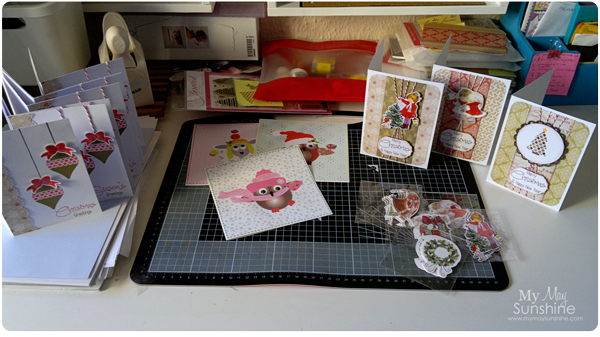 On my desk today are the cards I have made. I have made a few different styles but not too many. On the left are ones I have made using the Clearly Besotted Signature Christmas stamps and the ones in the middle I have made for Hollies teachers, love the owls and the sheep, cute. The one on the far right is one I made a set of for my sister in law, again using the Clearly besotted Signature Christmas stamps and then there are two that I made using some images I bought last year and have lots in the packages and thought I must use them this year and maybe will use them on some gift tags too. Just need to write them so I know whether I need any more and then give or post them.